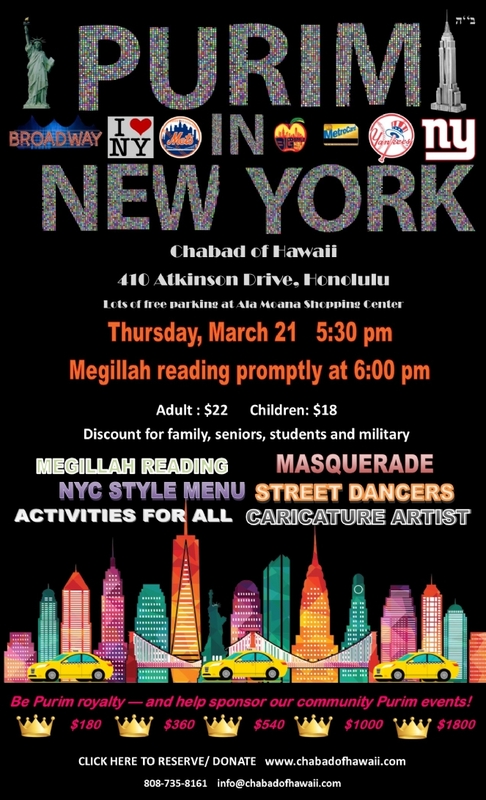 SCROLL DOWN FOR PURIM PARTY RESERVATIONS, SCHEDULE, MEGILLAH READINGS, DONATION. Thursday, March 21 at 5:30 pm at Chabad House, 410 Atkinson Drive, Honolulu, HI 96814 (Ground floor of Ala Moana Hotel, separate outdoor entrance.) Megillah reading promptly at 6:00 pm. PURIM MEGASITE(click here) - PURIM STORIES, RECIPES (HAMANTASHEN! ), STUDY, KIDS, AUDIO-VISUAL, etc etc. Lots of free parking at Ala Moana Shopping Center next door. PURIM DONATION: HELP SPREAD THE JOY OF PURIM IN HAWAII! Please consider helping Chabad bring all the joy of Purim to our community with a donation, below. Every amount counts! May you and yours be blessed many times in return by the One Above!